WR Chris Harper has verbally commited to Cal. “Cal is kind of like a dream school for me,” Harper told ESPN’s Greg Biggins. “I visited in the summer with Bryce [Treggs] and fell in love with the place. They recruited me all year, but I had no idea if they were going to offer me or not. Get excited for the New Memorial Stadium! The seating chart and pricing is available here. The rushing attack for both teams will be extremely vital in deciding who will control the rhythm of the game. Cal’s running game has been stout the last four games due to the improvement of the offensive line and the hard work of Running Backs Isi Sofele and CJ Anderson. Cal will look to smash down on a tough rush defense from Texas and show them the toughness of Cal football. The Longhorns feature two freshman running backs and a senior running back. All three were injured for the last few games of the season, but they will likely come back for the bowl game. When Texas wins it is because they have a good running game, reducing the pressure on their freshman quarterbacks. Just from the averages, Texas has a better yards/attempt then Cal, but the top two running backs for Cal are better than the top two for Texas overall. If Cal can force Texas’ quarterbacks to make all the plays, Cal should be in good shape as long as Case McCoy doesn’t go all Colt McCoy on us. On the defensive side, Texas has a top ten rushing defense while Cal is only around the top thirty rushing defenses. However, Heisman winner Robert Griffin III lit up Texas like a Christmas Tree during the last game of the season. If Cal can take advantage of the mistakes that Texas made against Baylor, then maybe Maynard, Isi, or CJ may be able to slip by the Texas front-line. If the Cal offensive line can beat down on the Longhorns, Cal will have a good chance of winning. However, if Cal’s running game can’t get anything going, Cal will be forced to have Maynard make plays, which didn’t work out so well early in the season. As long as Cal’s defense keeps the Longhorn’s rushing offense at bay, Cal can definitely go head to head against Texas’ rushing game both on offense and defense. 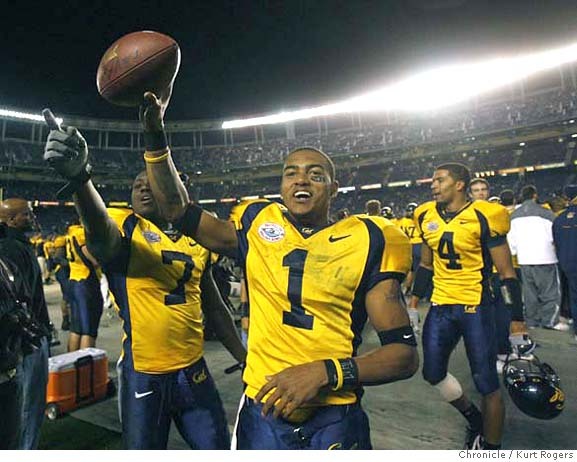 Categories: Uncategorized | Tags: cal football, rush defense | Permalink. Categories: Weekday Links | Tags: vince lombardi | Permalink.